As some you may know, I've never had a massive interest in make up and I've used the same make up for a very long time. I've taken it upon myself to break out my comfort shell and explore different products and one of the most important products is foundation. I've been using Rimmel Stay Matte and Rimmel Lasting Finish foundations mixed together for way too long, so long in fact I forgot why I even mixed them together! 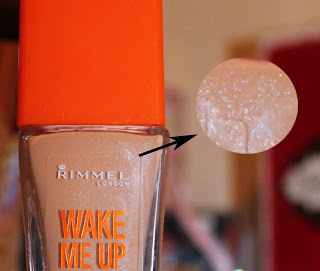 I decided I needed a new foundation and one I've heard about a lot is the Rimmel Wake Me Up so I thought I'd read some reviews and try it out myself. This foundation is easy to find as it's in any beauty/drug store and supermarkets at usually £8.99. I didn't really need to test the colour on my skin as I've always used Rimmel foundations colour 100 Ivory which is their palest colour. As soon as I applied this foundation for the first time, I was so pleased and I couldn't wait to review it for you. I use a Real Techniques Expert Face Brush to apply this foundation and I've found it blends in really well as it's not too runny or too thick. It can take a while to blend in but I never have any patches or tide marks. Does it have good coverage? If you want more coverage on certain areas you will need to build it up a little as it only has a medium coverage if you put a decent amount on but really it depends on your skin type as good skin only needs a little amount where as skin with blemishes and scars would need a bit more. Bare in mind I use a primer, I've found this product lasts the day as long as you can touch it up here and now and because of that it won't be great for those with oily skin. The shimmer/glitter that is mentioned in a lot of the reviews can be seen as a bit confusing. In the picture to my right, you can see the shimmer effect in the liquid. It can look rather unappealing and make you doubt using the foundation but you'll find it's very hard to actually see the shimmer on your skin unless you're in direct light. In fact the shimmer is nearly impossible to show up in photos, I'm really lucky you can see it in my one! I only noticed the shimmer for the first time when I was sat in the car looking in the mirror and there was sun shining directly in face and even then it looked like I just put a slightly glittery bronzer on and considering I wasn't wearing a powder it's likely to show up more. The shimmer does not put me off the foundation at all as this product is meant to make you seem more awake and give you a glowing look and that can be needed in the colder months as skin gets dryer and pale. I would recommend this foundation especially if you want a cheaper alternative to the high end products. I wouldn't necessarily recommend it if you want a high coverage or a foundation that's more matte and suitable for oily skin. I hope this has helped those of you that have been wondering whether this foundation is any good!